I played a game with the story deck from "The shifting sands". When I got 5 success tokens on this conspyracy, the story "The seventh gate" was in play. What should have happened if I had targeted that story? 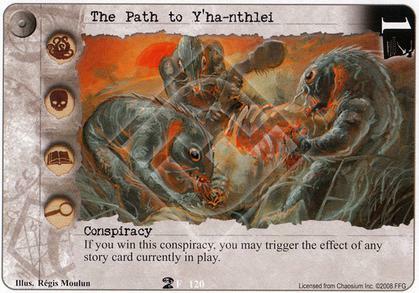 We suposed that I could have triggered any story in the deck, but that I had to shuffle both stories after that (the seventh gate and the triggered one) into the story deck and put in my won pile "The path to Y'ha-nthlei".